Goals are a great way of keeping track of your sales objectives, making sure that you and your team consistently meet the targets that keep your business running. In TeamWave, the Goals feature allows for you to keep track of that in different ways, giving you the best-possible insight into your progress. With the help of these two metrics, you can track value and quantity of deals. 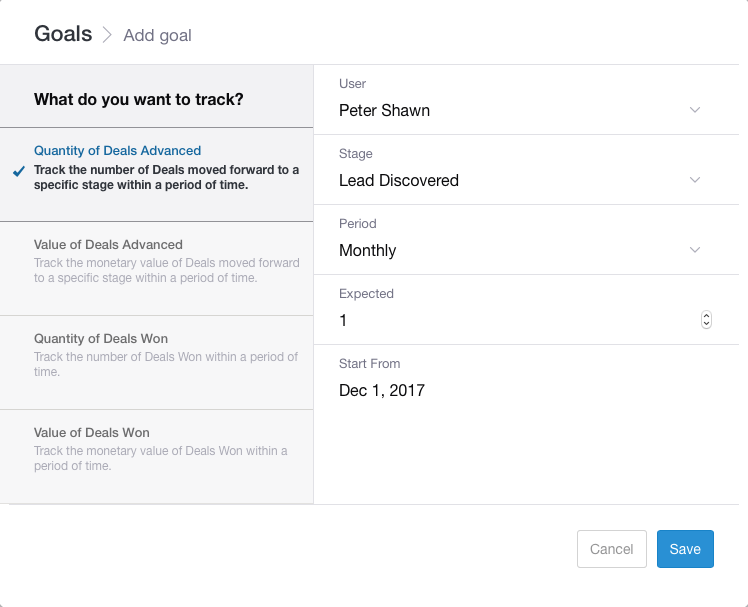 You can assign the expected number of deals to be moved forward to a specific stage in a pipeline in the defined period to a team member and track it. You can assign the expected value of deals to be moved forward to a specific stage in a pipeline in the defined period to a team member and track it. You can assign the expected number of deals to be won in a pipeline in the defined period to a team member and track it. You can assign the expected value of deals to be won in a pipeline in the defined period to a team member and track it. Learn how to add goals. Note: Deals won or advanced will be reflected only in deal owner’s Goals.